Pharma Marketing Blog: Eschenbach Announces Resignation, FDA Staffer Throws Shoes in "Farewell Kiss"
Eschenbach Announces Resignation, FDA Staffer Throws Shoes in "Farewell Kiss"
BETHESDA, Md -- Yesterday, as FDA Commissioner Andrew von Eschenbach was announcing that he plans to resign effective Jan. 20, 2009, a disgruntled FDA staffer rose abruptly from his seat about 12 feet away, reared his right arm and fired a shoe at the commissioner’s head while shouting: “This is a gift from the entire FDA staff; this is the farewell kiss, you dog!” The incident was captured by CNN cameras (see a frame from the video below). Dr. von Eschenbach deftly ducked and the shoe narrowly missed him. A few seconds later, the un-named staffer tossed his other shoe, again with great force, this time shouting, “This is from the elderly, the poor and those who were harmed by dangerous drugs approved by the FDA!” Again, the shoe sailed over the commissioner’s head. The shoe thrower was subdued by Janet Woodcock, Director of the FDA's Center for Drug Evaluation & Research and then beaten by members of her staff. 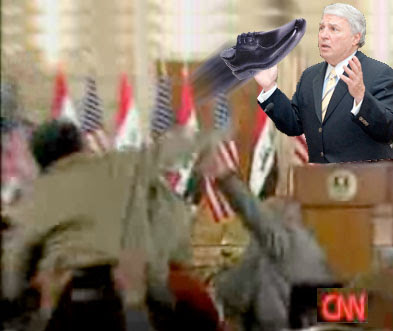 The shoe thrower's cries could be heard from a nearby room as von Eschenbach quipped "You wont have Andy to kick around anymore, because ladies and gentlemen, this is my last press conference." Immediately, a great cheer went up from the audience, which marched out the door with shoes in hand to form a spontaneous demonstration in front of FDA headquarters. "This is like a holiday," said one unidentified demonstrator. "This is just what we needed for revenge." SHOES HAVE BECME CHEAPER NOW FOR HURLING TO DEMONSTRATE. BUT IF IT DOES NOT HIT THE TARGET OBJECT, IT LOSES ITS IMPORTANCE. PPL SHOULD PRACTISE TARGET SHOOTING WITH SHOES NEXT ONWARDS. LONG LIVE SHOES AS IT HAS BEEEN PROMOTED FROM THE FEET TO THE PALMS !! !